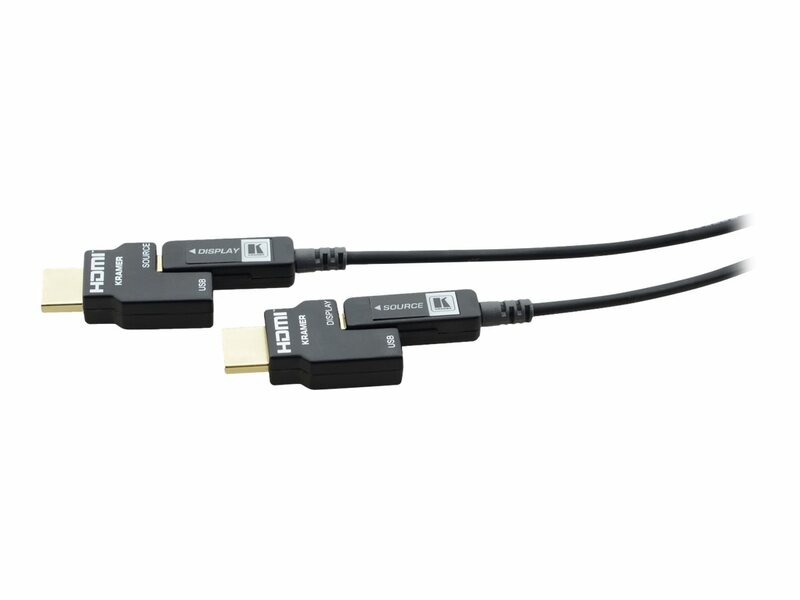 Kramer's AOCH/60 is a state of the art Active Optical HDMI Cable for running 4K UHD HDMI 2.0 signals, 4K@60Hz (4:4:4) UHD, over long distances up to 100 meter (328 ft), in a simple & practical way. This Hybrid-Fiber Cable HDMI ends can quickly detach, offering a much smaller head that can be run through conduit or other tight spaces with the included pulling capsule, they are also interchangeable. DVI ends can be purchased separately. The AOCH/60 cables are thinner, lighter and more flexible than copper or even standard optical cables while providing transparent EDID, HDCP and HDR support without signal attenuation and also provide reduced risk of EMI and RFI interference which provides a perfect solution for critical AV installations that demand the highest signal integrity.